The TPM system constantly monitors the tire inflation pressure. For this purpose the tire inflation pressure and temperature are measured in the tire at certain intervals and are transmitted telemetrically over a HF link to the TPM control unit. The control unit evaluates the data received and forwards the information to the instrument cluster. 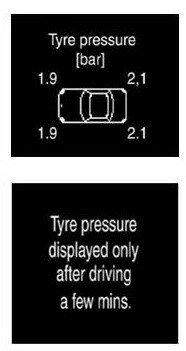 The multifunction display in the instrument cluster notifies the driver of the current tire inflation pressure or of any necessary corrections to the tire pressure, and alerts him to punctures. The components from the two system suppliers (Beru/Siemens) are not compatible with each other! This is particularly important when using complete wheel/tire assemblies with wheel sensors from a different vehicle. If incorrect makes are installed or mixed, proper functioning of the system can no longer be guaranteed. The TPM control unit automatically detects a new pressure setting whenever a pressure change of more than 0.2 bar is made at least 2 wheels. After the vehicle starts to move, the new pressure readings are checked for compliance with the minimum pressure and for plausibility - if they are OK, the nominal values and warning thresholds are adjusted accordingly. The driver can still perform manual activation via the menu. This informs the control unit that the current pressure settings are to be regarded as nominal values. Any active warning messages are canceled and the TPM warning lamp goes out. After the vehicle starts to move, the new pressure readings are checked for compliance with the minimum pressure and for plausibility - if they are OK, the nominal values and warning thresholds are adjusted accordingly. three sequential logs once per minute. Pressure change Driving condition: >= 0.2 bar, 3 signals sent at 15 sec intervals after 15 sec. Parking: >= 0.2 bar, 2 signals sent at 20 sec intervals after 30 sec at the latest. The antennas serve solely to identify the positions of the front wheels (rear wheels on model 164). The trigger pulse is transmitted on request from the control unit. can only be recognized when the vehicle is cornering based on the steering angle and the different wheel rotational speeds. The signals are received by the central antenna and forwarded to the control unit over a discrete line. continues to operate for 20 min after the journey, then it shuts itself down. The control unit wakes up when the CAN-B is woken and is ready to operate at “Ignition ON”, when messages are transmitted to the instrument cluster. The system can issue a variety of warnings (Soft or Hard). The warnings are output with different priorities. • Due to the different systems and the diversity of display messages (system errors/ warnings and instructions), it is all the more important that these be correctly interpreted so that unnecessary diagnostic work is avoided. System errors are recorded with fault entries, which must always be processed in accordance with the fault tree. Please note that actual values may only be used for diagnosis when this is explicitly permitted. 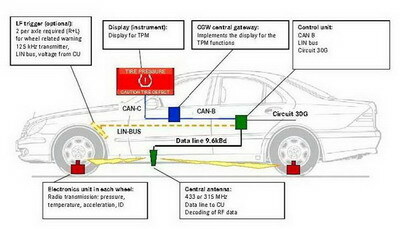 In this section we add some useful information about some Mercedes Benz 211 Tire Pressure Monitor (TPM) Systems and it features.